Butler County, Missouri, was the home of a small group of Old Order Amish Mennonites from about 1920 to 1924. About 15 families, consisting of settlers mostly from Reno County, Kansas, including families of Miller, Bontrager, Glick, Amstutz, Troyer, Hostetler, Chupp, and Mast, lived in the area between Poplar Bluff and Harviell. The one and only minister of the group was Chriss Bontrager. The settlement was never very substantial, and in 1924 most of the Amish moved 50 miles (80 km) east to Scott County and to other states. The Amish buried a few of their people in the county, but later took up their remains and shipped them to Kansas. Hostetler, John A. 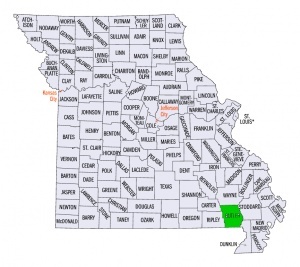 "Butler County (Missouri, USA)." Global Anabaptist Mennonite Encyclopedia Online. 1953. Web. 20 Apr 2019. http://gameo.org/index.php?title=Butler_County_(Missouri,_USA)&oldid=91309. Hostetler, John A. (1953). Butler County (Missouri, USA). Global Anabaptist Mennonite Encyclopedia Online. Retrieved 20 April 2019, from http://gameo.org/index.php?title=Butler_County_(Missouri,_USA)&oldid=91309. Adapted by permission of Herald Press, Harrisonburg, Virginia, from Mennonite Encyclopedia, Vol. 1, p. 486. All rights reserved. This page was last modified on 23 August 2013, at 13:56.